I have three school-aged children, each with roughly 25 kids in their class. Add to that the 15 kids in my daughter's preschool class, and that's a lot of valentines to prepare. Since I have so much extra time these days, I thought I'd personally crochet 90 little Valentine-themed afghans and bake 90 boxes of homemade, perfectly-iced cookies. Oh, I hope you know how I jest. Have a WFMW tip you'd like to share with the blogosphere? Leave your link below. Remember to look through the guidelines, especially if this is your first time to participate. As always, thanks for playing along! NEXT WEEK'S WFMW is a themed edition--we'll all be listing our favorite on-line stores. Whether it's your favorite source of good bargains or unusual products, post your links of best places to shop on the web. The marketing people will love us for this. 167. Makeshift Mama - Smooth, Soft Underarms! 195. Sheila @ Who can find a wife of valor? The links are now closed. Join us next week for the Online Shopping Edition of Works-For-Me Wednesday! I'm going for the Valentine's ideas too. Mine are still too young for Valentine's goodies, but the idea is fantastic and one that I hope I will remember for when the time comes. What, no half-used erasers attached to the valentines? How will their friends know they are really loved?! You shouldn't have explained why you were making Valentines two weeks early. I was thinking, "wow. she really has it all together. what an amazingly organized mom." Apparently, I didn't connect the whole "will be outrunning lions" trip being gone over Valentine's day. Great job! We've created Valentines on the computer for the last two years.... much easier - and I only have 2 kids going to school! Those are so cute!! Great idea ;). Am wishing I had a good color printer. You're a smart lady. Now that I was finally getting past the spelling bee memories, you bring up Valentine's Day At School. Oh, the pain! Johnny loves me! Jeremy doesn't! He thinks I'm "nice!" Oh, geeze...I messed up and left a long (parenthetical) before I edited. Should I relist? I am really sorry! Oh, I can't even fathom doing valentines! Way to go. On another note, my tip says envelopes for lists, but it's not, it's clumpless mascara! Any idea on how to change this? Brilliant idea! I think I will do that this year also. Thanks for the inspiration! How creative! My kids aren't at the age yet for exchanging Valentine Day Cards, but I am going to keep this idea tucked away. Thank you. This is my first year for Valentine's so I've been on the lookout for cute ideas. I think this will work perfectly for us. Thanks! 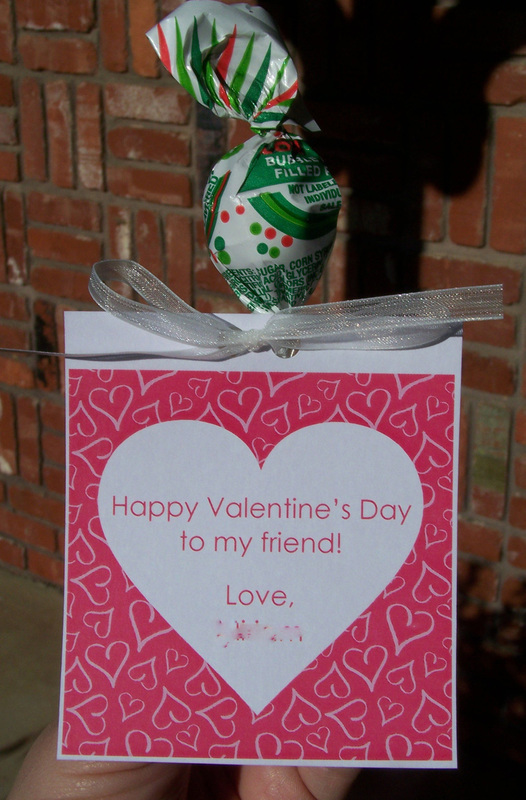 This is baby's first valentine's day, so we'll do this for his friends at daycare. He is part of a class of ALL boys, so we'll have to find something age and gender appropriate that is CHEAP to go with his cards. Maybe chocolate for the Mommies wouldn't be a bad idea??? Thanks for the tip! Good idea! Individually signed is nice but not always practical during busy times. I hadn't thought of doing Valentine's on the computer. Usually I buy Valentine's on clearance after Valentine's Day is done for the next year. 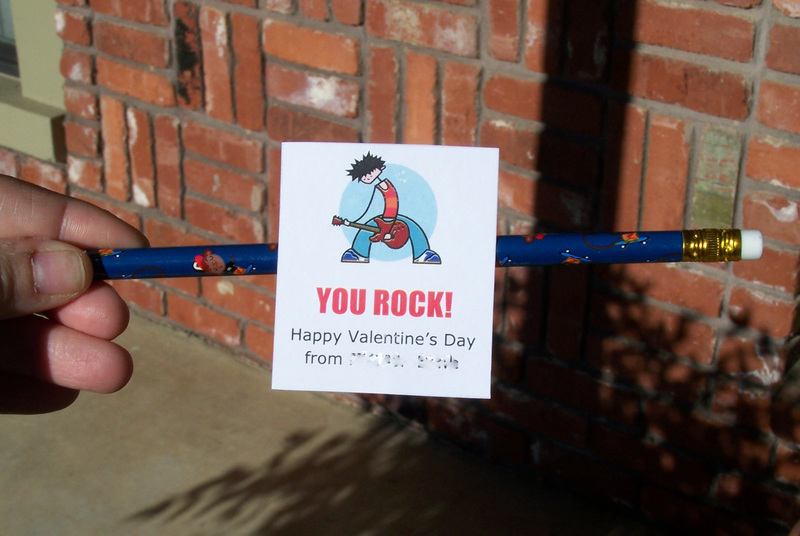 I don't think I ever received a pencil for Valentine's day, but it makes total sense when you're handing them out to all your schoolmates! Who doesn't need a pencil? Great idea! I love this idea! Thanks for sharing. My Princess is still kinda young, but I will keep it in mind for later. This is my first year to experience Valentines... Thanks for the tip! Great idea! We are SO doing that!! I especially love the pencil idea- the last thing my kids need is more candy! Great idea! I'll def. remember this when my son is school-aged. Wow what a great idea. Very cute!! My kids would have a great time designing their own on the computer, too, if I can figure out how to do this! Awesome and easy. Sounds perfect for me! I did the same thing last year . . . great minds think alike! These are a really cute idea, I already have the assembly line of kids signing their autographs for this year, but I will have to remember that for next year. Shannon, that's a great idea! I agree that supervising all the signing is a drag. Good job finding a solution. This is the first time in a while I posted a wfmw. We have store-bought (but still artsy) valentines this year b/c my B.I.L. gave them as a Christmas gift. Odd, but thoughtful. I don't have kids yet, but I always liked to do cute valentines with my little brother. Homemade ones are so much more thoughtful and cute than Sponge bob or My little pony. Have fun being out of the country!! Love your blog - I've mostly been a lurker, so I'm stepping out!! This is my first time participating too. I hope I did everything right. Valentine's Day already? Wasn't it just Christmas not too long ago? I guess I'd better get on the ball with Valentine's for both of my boys. Thanks for the great tip! I've found a lot of very useful ideas today! Wish I had time to read each one! Great idea! Think I'll be a copycat on this one. Thanks! What a darling Valentine idea! I love how you tied the lollipop to it. I'm sure the kids will love making them and giving them out! Great Job! I miss Valentine's!!! My boys are 14 and 17,and if they gave them out at school now, we'd have to move for the shame of it. What a great idea, and the older ones can even personalize on the computer if they want. So much better than those cheaply made, but highly expensive ones from the store! Oh, love that easy valentine idea! Thank you ! Yikes! I had forgotten about the whole class valentine thing. Thankfully, my kids are a few years away from that nonsense. Yup, I'm a party pooper. Kudos to you for the effort on behalf of your lucky kiddos though. :( It's only 10:00pm my time on Wednesday and I pondered all day long on what I was going to share so I finally get my crying baby to sleep, and FINALLY get to sit at my computer and I post my post on my blog and come over here to put it on Mr. Linky and I read that Mr. Linky is CLOSED? And I have to wait until next week??? I'm kinda devastated here. LOL I look forward to WFMW and I hope that you change it to allow people on the West Coast to be able to post until 11:59pm PST. That is SUCH a good idea. We have a hard time with the writing over, and over, and over, and over.... this will be a great change of pace! try 6 kids..thats 6 times 30=gulp..alot of valetines! First of all, I seriously almost slit my mommy-wrist before realizing that you were in fact kidding about the afghans. It made me feel like the worst mom in the world. Next, I LOVE this idea!!! My two little ones are still at a Jewish preschool so I've only one kid's class to worry about this year. But getting him to write the names is like pulling teeth! So I think I'll give this one a try this year. I just wanted to let you know how much I appreciate your giveaway idea. I love the contests, of course, but as a new blogger, it's been a fun way to see what others are doing. I've seen lots of ideas of things I want to do on my blog! Hope you and your family have a great day! You are a brilliant, brilliant woman.